The autumn rains have begun and already leaves are changing colour. 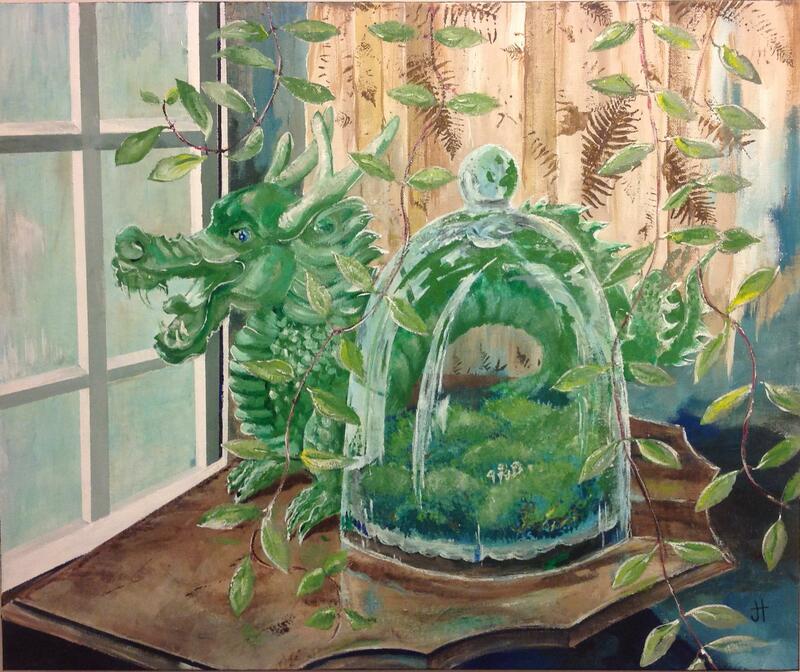 Before the plants go into their winter sleep, I want to pay tribute to the greens of summer. In particular, I love the ground covers in my garden. They create thick carpets of green and provide a backdrop for other garden colour. Periwinkle is my favourite ground cover. In early summer blue flowers dot the shiny green foliage. The plant grows well in our very shady yard and makes a good transition from lawn to woodland. The Creeping Jenny in our yard is a transplant from my grandfather’s farm, probably by way of my mom and dad’s property. 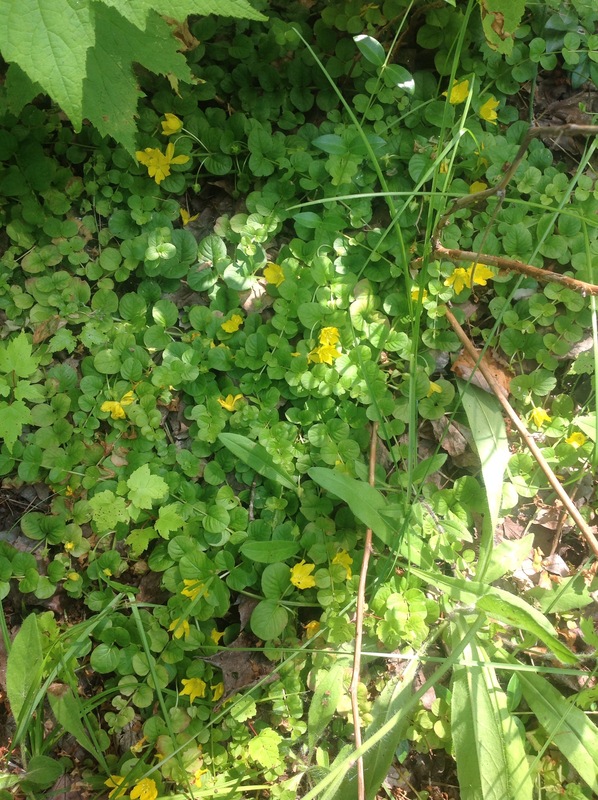 The flowers are bright yellow and the leaves grow in pairs of gradually smaller size. 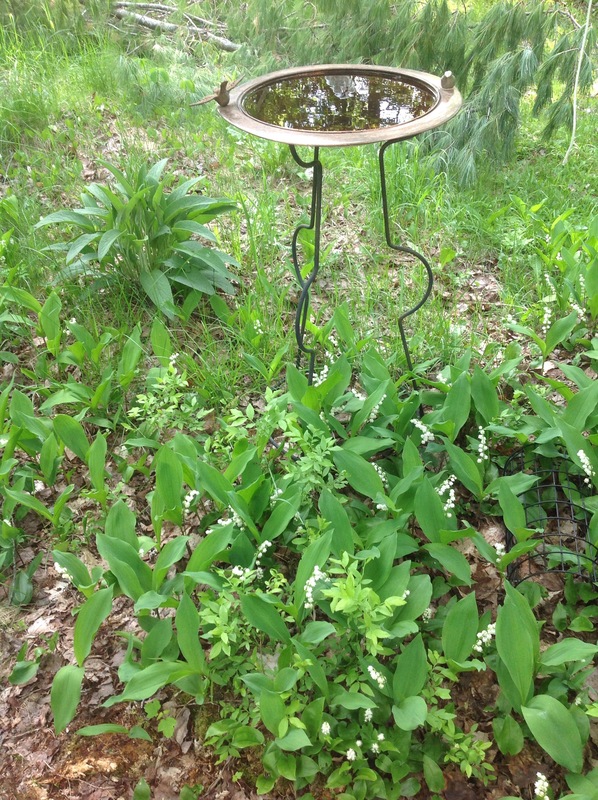 Lily of the Valley grows along the paths in our yard. I love the white flowers and their gentle perfume. Although they are poisonous, the boiled leaves make a pretty grey dye. Soon the ground covers in our area will be layers of autumn leaves and then, blankets of fallen snow. My challenge for next year’s garden will be to find another low-growing cover plant to add to my collection. 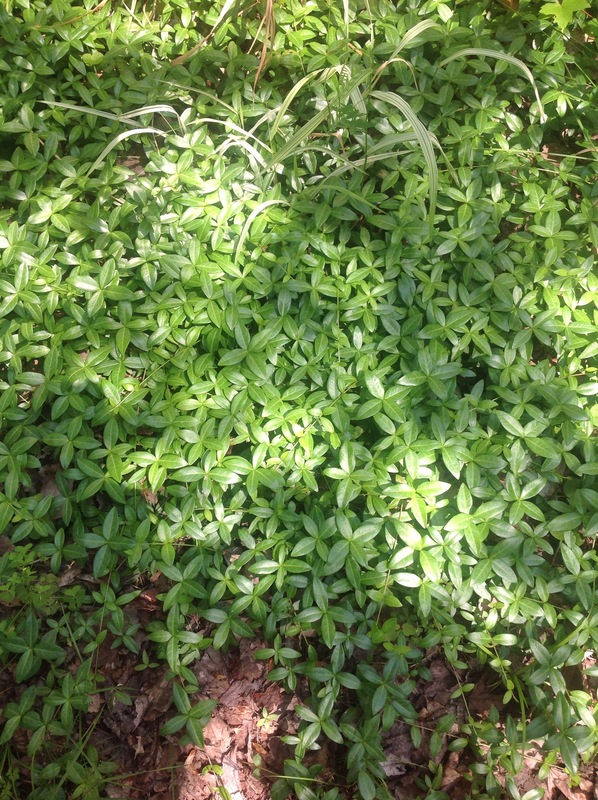 What are your favourite ground covers? 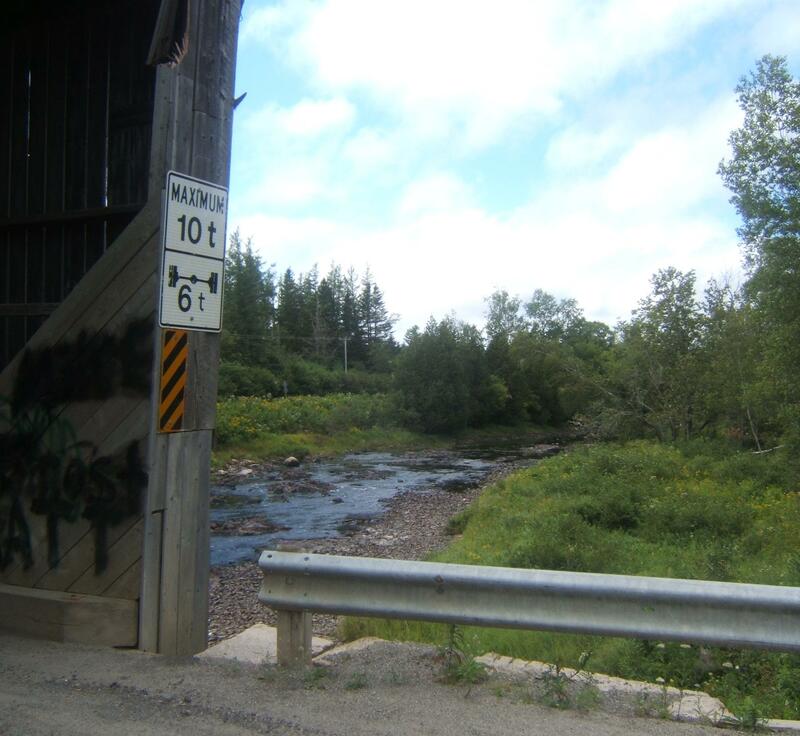 Most covered bridges in new Brunswick have some unique feature that makes them memorable, distinct from all other covered bridges. Sometimes this is because of a puzzle. Why, for example, are ropes and chains hung from the rafters of a covered bridge? 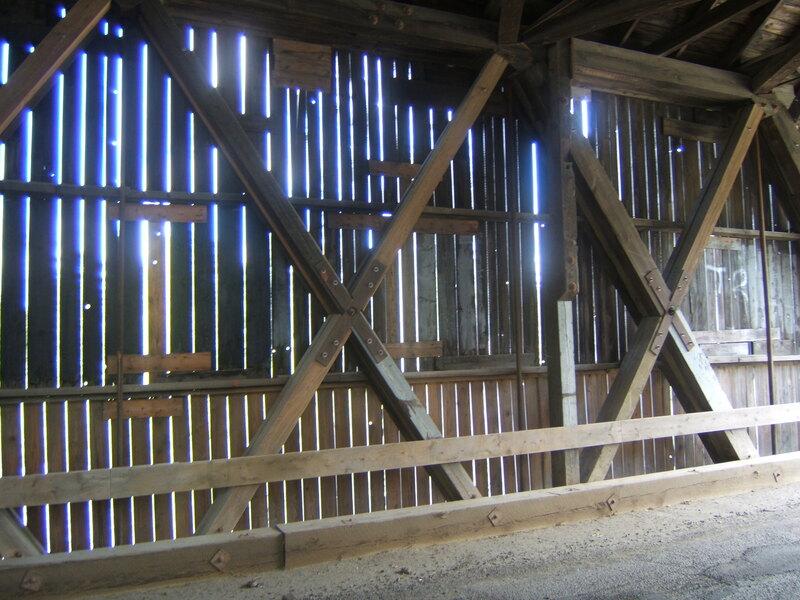 At the end of August, we travelled to some of the covered bridges in Charlotte County. 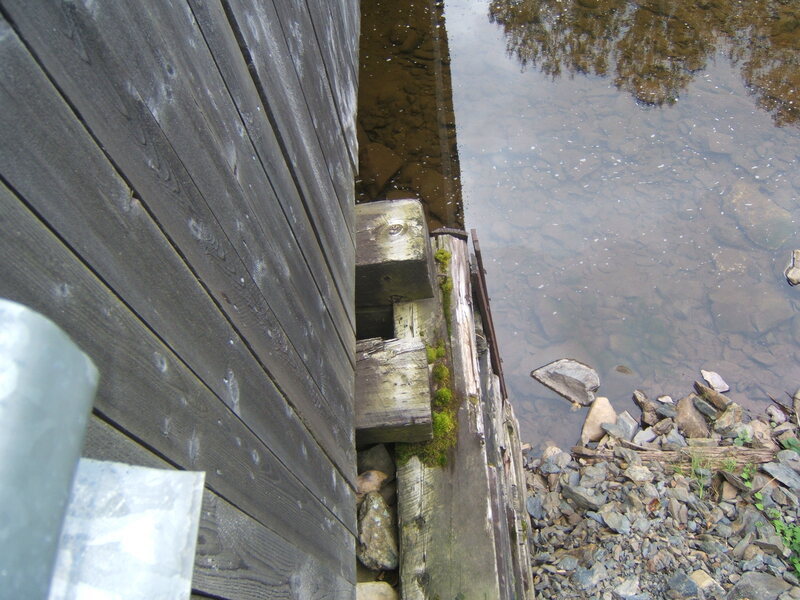 One of these was Digdeguash River #4, the McCann Covered Bridge near Rollingdam. 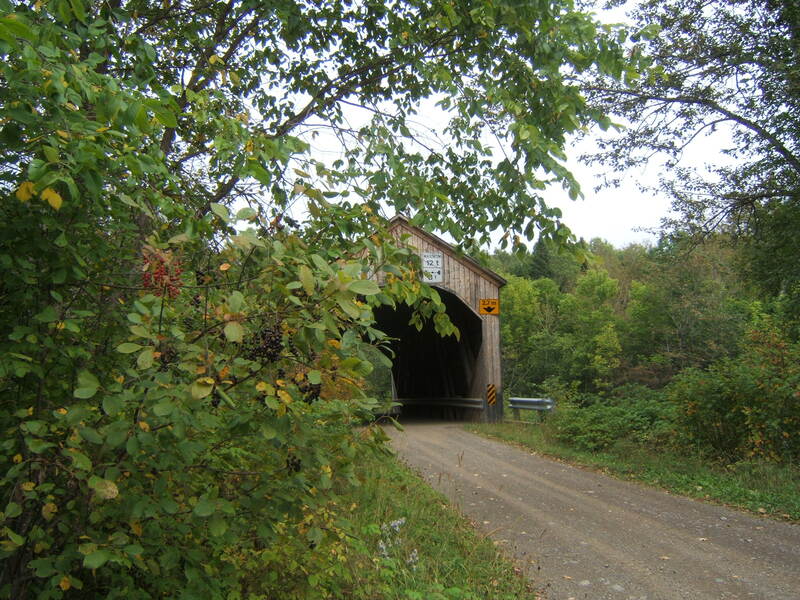 The bridge was built in 1938. On the day we visited, the water was very low, so we could see the ‘bones’ of the Digdeguash River. The bridge walls and beams were covered with names of people, done in knife and pencil and pen, felt marker and paint. The air was thick with the whirr of cicadas. In the rafters of the bridge thick ropes, now frayed, had been hung from the cross beams. There was also a chain hung from one rafter and a piece of steel cable from another. We discussed possible reasons for these, but didn’t have a chance to talk to any local people who may have known the true reason. What do you think might be the reason for the ropes and cable and chains? 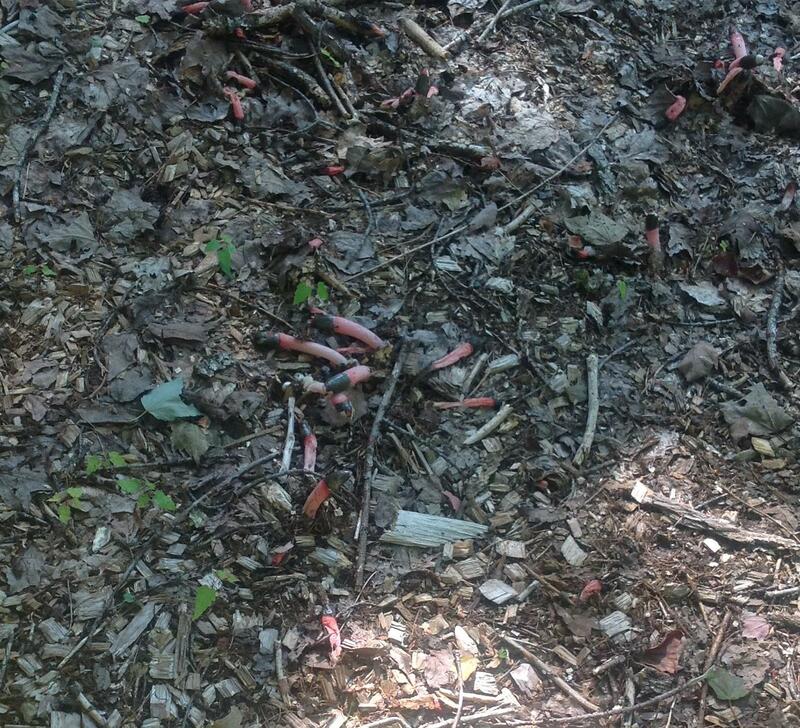 stinkhorns – what’s not to love? This morning I was trimming the vines at our front door and resting occasionally in my yellow lawn chair. Every time I sat down, I smelled a very disgusting smell. It didn’t take me long to find the source. Something I have never seen before – an Elegant Stinkhorn fungus (Mutinus elegans). Elegant is not an apt word for this fungus in my opinion. 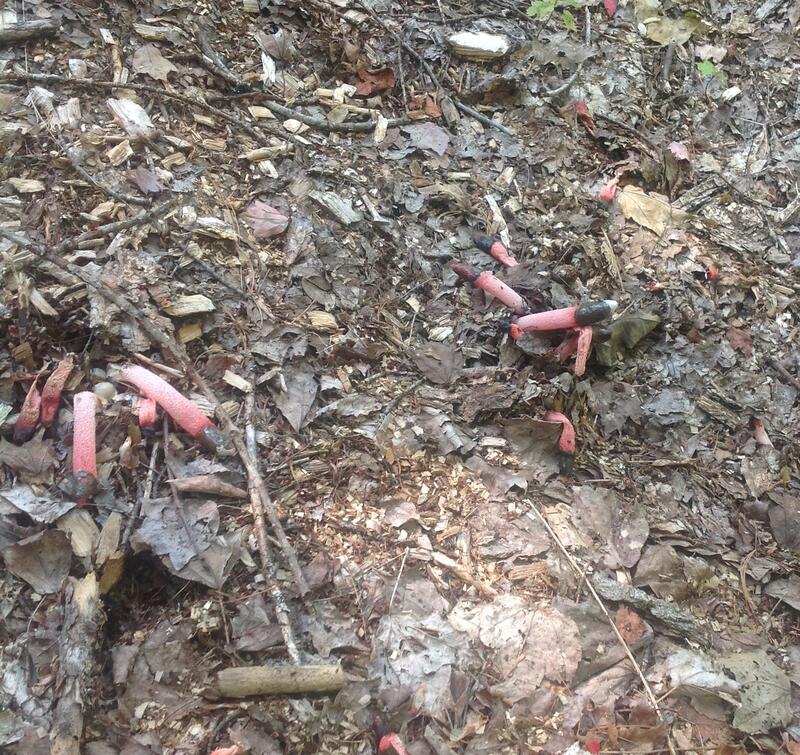 Its fruiting body consists of long pink cylinders covered with a dark brown mucilage at the tip. They belong to the family ‘Phallaceae’ (I understand the source of this name). The cylinder emerges from a whitish ‘egg’, a puffball-like body. Flies were buzzing about, attracted to the putrid smell. My thought when I first saw the fungus was that Aliens had invaded. 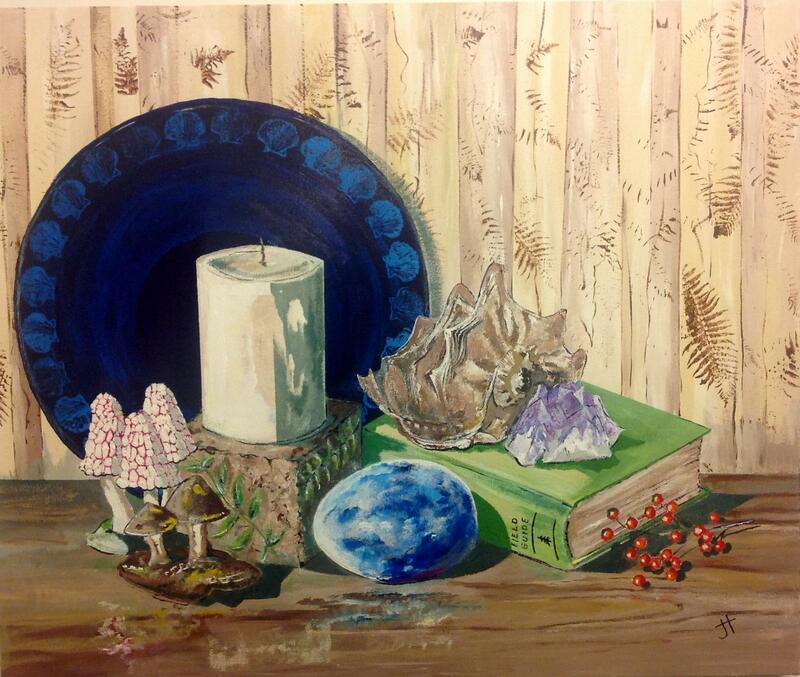 Actually, the fungus has found an ideal location to grow. Recently it has been very wet, after a long spell of dry weather. 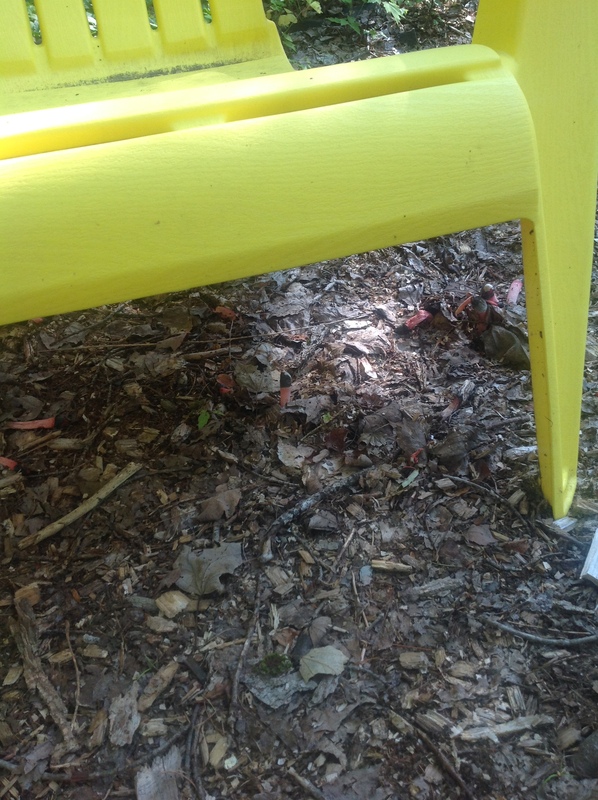 The area where I keep my lawn chairs is mulched with wood chips, providing a source of food for the Stinkhorns. I think the space had been made more habitable by the lawn chair which has kept air movement down and humidity high. Sorry. I am a botanist and I understand that I am the invader on our property. But these look disgusting, smell disgusting and, if people have to come to my front door, no one will ever visit me again. 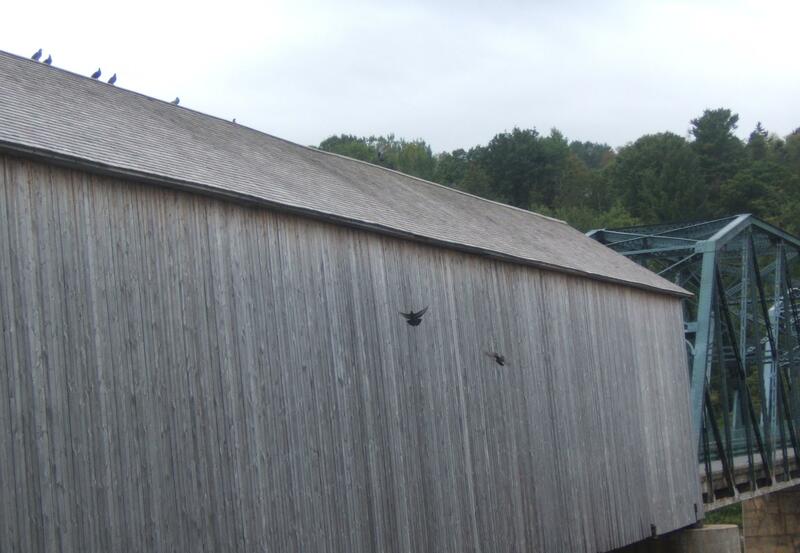 On our drive last weekend, we visited three covered bridges. make a list of the sounds I hear and try to absorb the ‘feeling’ each bridge evokes. 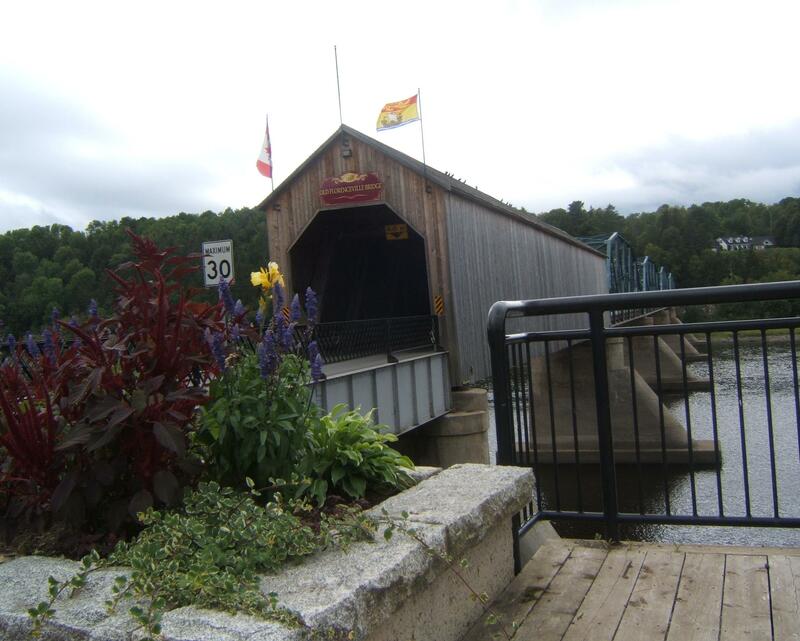 I knew ahead of time, the Florenceville Bridge across the St. John River would be a different experience. Walking the bridge would be unlikely – there is no pedestrian walkway, the traffic is quite heavy and the bridge is narrow. I did cross the bridge in our truck, a harrowing adventure since the bridge traffic is two-way. Cars slow down when they meet, but the locals are seasoned to the width and scary-brave. Only one span of the Florenceville Bridge is covered (built in 1907) and this is very well maintained. 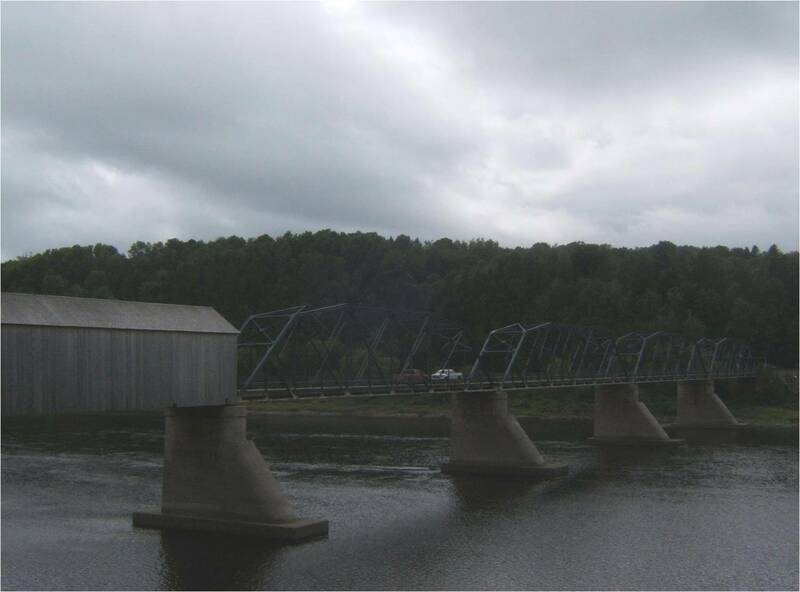 The other four spans are steel trusses. 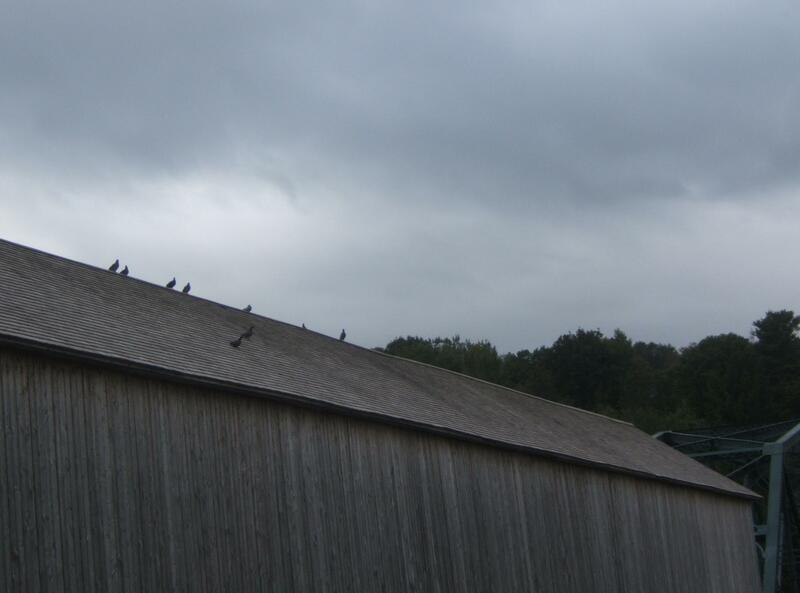 The pigeons perching on the roof of the bridge are its most obvious wild life. Yesterday, we drove to see a few bridges in north-western New Brunswick. 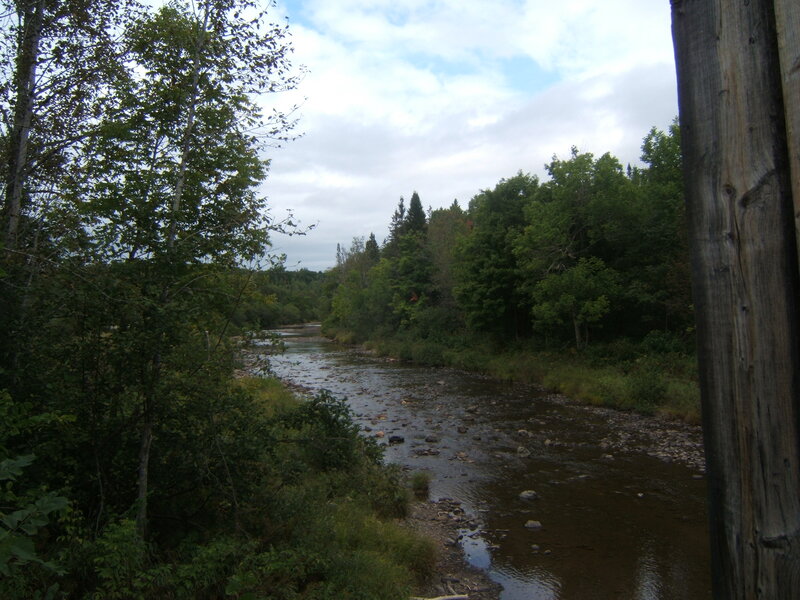 One of these was the North Becaguimec River #4 (Ellis Covered Bridge) in Carleton County. The bridge was built in 1909 and is 18.3 meters long. 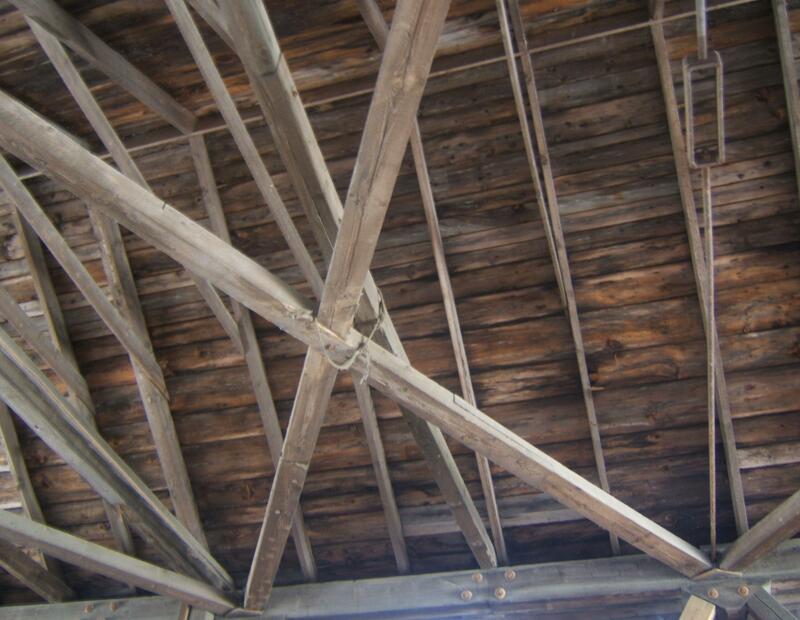 It shows lots of recent maintenance, including a shingled roof and new timbers and boards in the roof area. The late summer season dominates the atmosphere of the bridges we are visiting. At this bridge, the choke cherries are black, the purple asters are the dominant flower and clematis has set its fuzzy balls of seed. 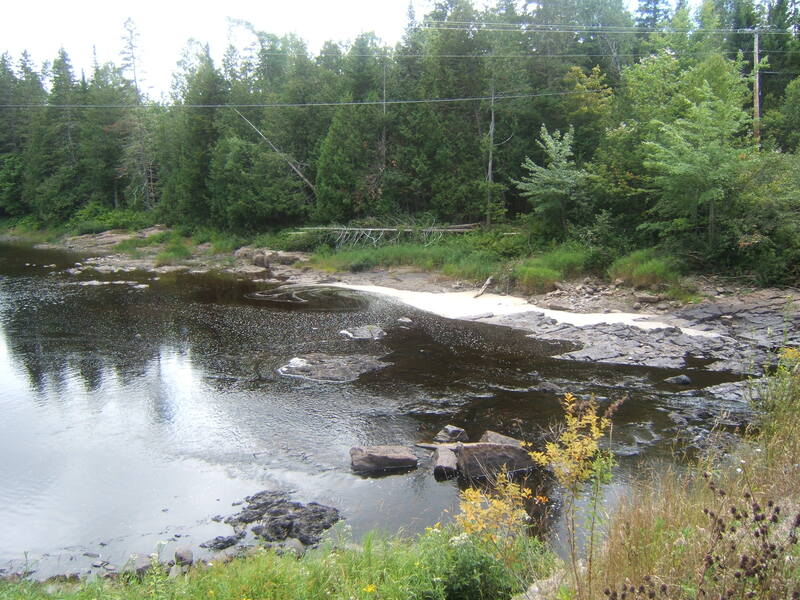 The North Becaguimec is a rocky brook, very shallow after a dry summer. 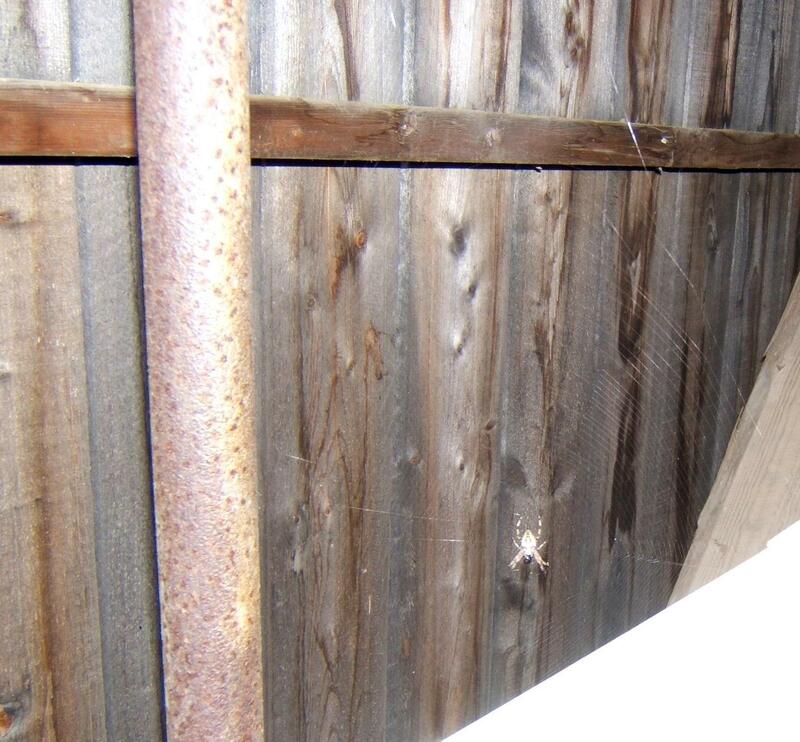 Although there are usually lots of spider webs in a covered bridge, this was the first time I saw a spider. The spider was still and stubborn, not moving for me or my camera. 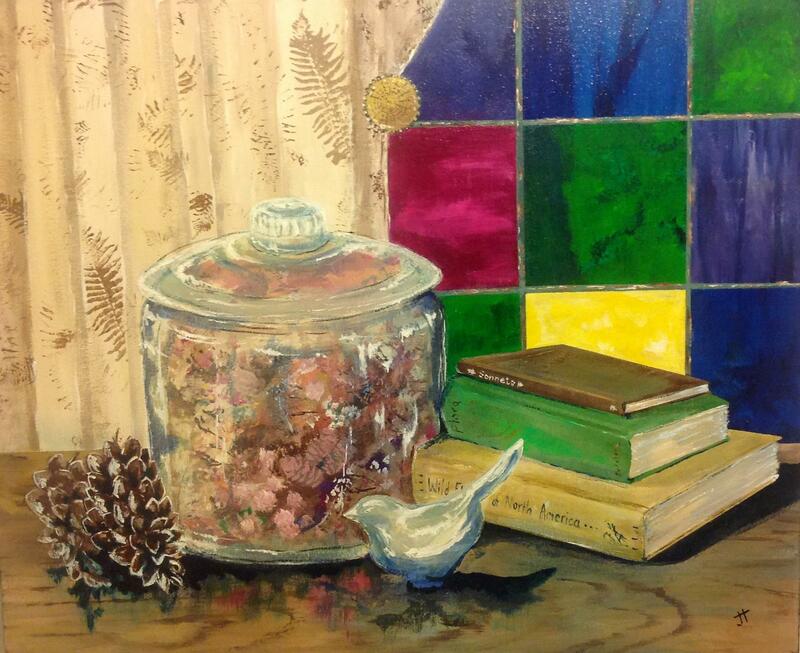 As I have said before, in making my manuscript of poems about plants and animals living in the shelter of the covered bridge, I have been trying some different poetic forms. This is my first ghazal. Ghazals are meant to tell of the pain of loss and the triumph of love in spite of loss. A ghazal consists of 5-15 couplets. The second line of each couplet repeats a refrain established in the first couplet. The poem can follow any meter but the meter must stay consistent in every line of the poem.